Carl Lewis was a successful track and field athlete whose career spanned two decades from 1979 to 1997. He won ten medals as a member of five Olympic teams and won ten World Championship medals. Lewis was born in Birmingham, Alabama, on July 1, 1961, to William McKinley Lewis, Jr., a former football player and member of the Tuskegee Institute track team, and Evelyn Lawler, who attended Tuskegee on a track-and-field scholarship and participated in the Olympic Games in 1952. The third of four children, Carl moved with his family to Willingboro, New Jersey, in 1963. The Lewis parents moved to the community to coach the Willingboro Track Club. Lewis competed in his first track meet at age nine. By his junior year at Willingboro High School, he had become one of the best long jumpers in New Jersey, reaching his personal goal of more than twenty-five feet when he jumped 25 feet, 9 inches. After considering multiple offers, Lewis decided to attend the University of Houston where Coach Tom Tellez reworked his long jump and developed him as a sprinter. Lewis broke records and won indoor and outdoor collegiate and national titles in the long jump and sprint. In 1981, he received the Sullivan Award as the most outstanding amateur athlete in the United States. The following year Lewis received the Jesse Owens Award, given to the outstanding track and field performer of the year. 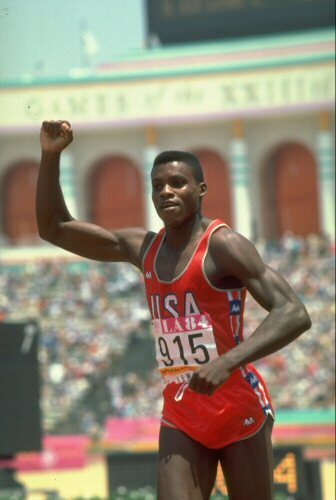 Carl Lewis made the 1980 Olympic team in both the long jump and the sprint. The U.S. boycott of the games held in the Soviet Union that year meant that Lewis’ first Olympic competition would be in Los Angeles four years later. In the summer of 1984, Lewis won gold medals in all four of his events, the 100-meter race, the 200-meter race, the long jump, and the 4×100 relay, matching Jesse Owens at the 1936 Olympics. Four years later, at the Olympics in Seoul, Lewis won two gold medals and silver. His Olympic career ended in Atlanta in 1996. Over that career, Lewis won nine gold and one silver medals over four games. In World Champion events, he won ten medals, eight gold, one silver, and one bronze. During his career, Lewis held eight World records and sixteen American records. http://www.carllewis.com; John Devaney, Carl! The Story of an American Hero (New York: Bantam Books, 1984); Carl Lewis with Jeffrey Marx, Inside Track: My Professional Life in Amateur Track and Field (New York: Simon and Schuster, 1990). Amateur Track and Field (New York: Simon and Schuster, 1990).